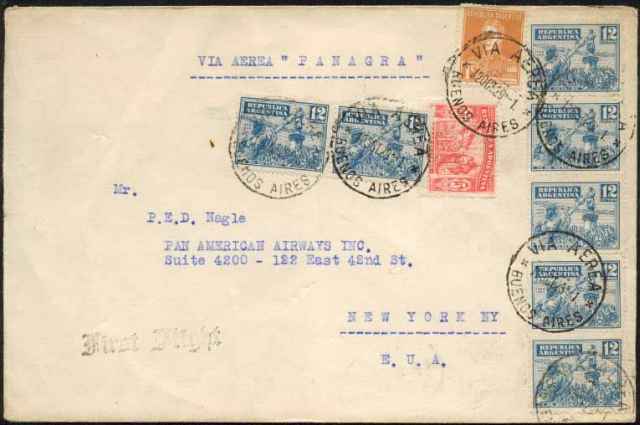 first return flight of Foreign Air Mail Route 9's extension to Buenos Aires. between Cristobal, Canal Zone, and Mollenda, Peru, May 17-20, 1929. Cristobal to Brownsville, Texas, through Central American and Mexico. As first inaugurated, F.A.M. 9 flew along most of the west coast of South America. On July 16, 1929, the route was extended to Santiago, Chile. This flight over the Andes was the next extension. The outbound flight left Cristobal on October 8 although covers from there are postmarked October 7. 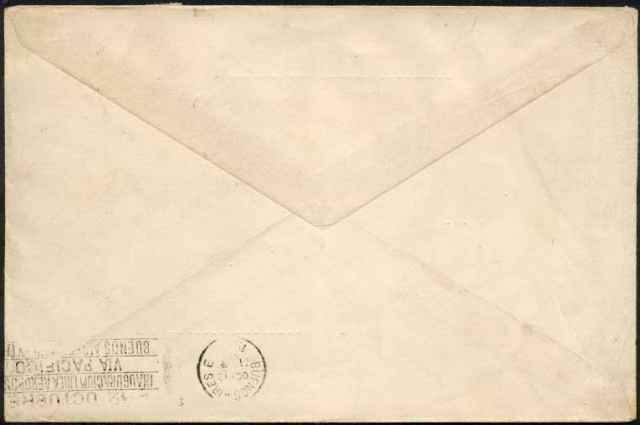 This cover is one of the 3,897 covers dispatched by Buenos Aires on the return flight. Most were destined for the United States with less than 20 being sent to any of the intermediate stops. there was a special slogan machine cancel on the rear for Buenos Aires E. dated OCT 12. The slogan is 12 OCTUBRE | INAUGURACION LINEA AEROPOSTAL | VIA PACIFICO | BUENOS AIRES-NEUVA - YORK. The routing from Brownsville to New York City was on three Contract Air Mail Routes. C.A.M. Route 22 flew from Brownsville to Dallas - Fort Worth. From there it would have flown north to Chicago on C.A.M. 3 and then to New York via C.A.M. 17. It would be interesting to have transit marks for this flight but there are none. by Columbus issued on October 12, 1929 (Scott 373). There is also one 5c light red "Spain" and "Argentina" from the same issue (Scott 372). The rate of 90c was completed with a 1927 1c buff San Martin (Scott 363). These stamps were cancelled with 6 VIA AEREA CDS from Buenos Aires. The sender typed VIA AEREA " P A N A G R A" to identify the routing. The addressee was in the headquarters offices of Pan American Airways, Inc. in New York City. and many became available when Pan American files were sold after the company's bankruptcy.